Warning: Do not rotate arm if fracture or dislocation is suspected. 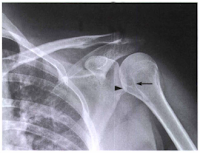 Fracture and/or dislocations of the proximal humerus and the shoulder girdle may demonstrate calcium deposits in the muscles, tendons, or bursal structures. Some pathology, such as osteoporosis, osteoarthritis, and bony tumors, also may be evident. Perform radiograph with the patient in an erect or supine position. (The erect position is usually less painful for patient, if condition allows.) Rotate body toward affected side, if necessary, to place shoulder in contact with IR or tabletop. Position patient to center scapulohumeral joint to center or IR. Adduct extended arm slighly; then internally rotate arm (pronate hand) until epicondyles of distal humerus are perpendicular to IR. Collimate on four sides, with lateral and upper borders adjusted to soft tissue margins. Lateral view of proximal humerus and lateral two-thirds of the clavicle and upper scapula are demonstrated, including the relationship of the humeral head to the glenoid cavity. Full internal rotation position is evidenced by the lesser tubercle visualized in full profile on the medial aspect of the humeral head. An outline of the greater tubercle should be visualized superimposed over the hemeral head. 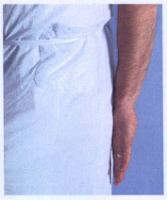 Collimation should be visible on four sides to area of affected shoulder. CR and center of collimation field should be at scapulohumeral joint. Optimal density and contrast with no motion will demonstrate clear, sharp bony trabecular markings with soft tissue detail visible for possible calcium deposits.